PHOTO: COURTESY OF SIEMENS AG © 2013. ALL RIGHTS RESERVED. The Southeast has, by far, the largest shallow water offshore wind resource on the East Coast. According to the National Renewable Energy Lab (NREL), Virginia, North Carolina, South Carolina, and Georgia have 82% of the East Coast resource in shallow water and more than 12 miles offshore and 45% of the total East Coast offshore wind resource. 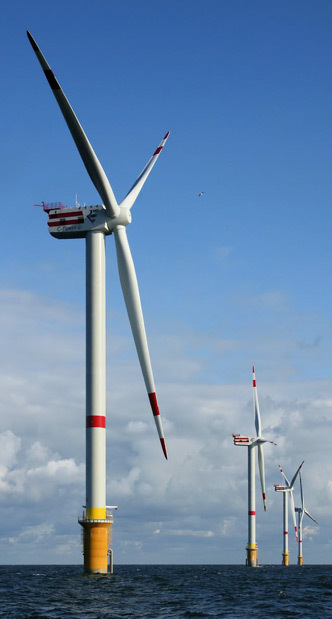 Florida’s offshore wind resource was not quantified in this study. Offshore wind and biomass represent the two largest scale renewable energy options for the Southeastern U.S.
A quick scan of the NREL resource maps shows that average offshore wind speeds tend to be slightly lower in the more southern states. However, it is important to keep in mind that the most important metric is ultimately the cost of the energy produced and the Southeast has numerous advantages that should result in lower offshore wind energy costs compared to projects in regions to the north. There are some distinct resource quality advantages in the Southeast. For example, the proximity of the warm water Gulf Stream to the coast, especially off of North Carolina, creates a highly energetic microclimate with higher wind speeds. Finally, since the continental shelf in the Southeast is much more gently sloped, it is possible to get further offshore and still stay in “shallow” water when compared to regions to the north, which significantly improves the resource quality at a given water depth.